Though you’ve retired your skis or snowboard for the summer, you can still look to the mountains for your summer adrenaline fix. 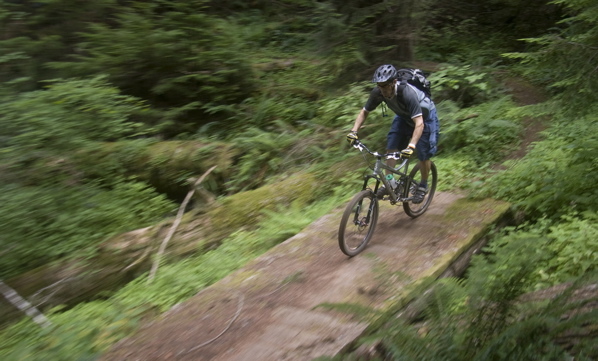 Careening down steep pitches can be a year-round activity; all you need are two wheels, a helmet and balls of steel. Herewith, Calgary’s top mountain biking spots. In 2008, Whistler’s Gravity Logic team transformed COP’s makeshift bike park – basically a pit of rotting lumber – into a quarter-million-dollar playground with excavated downhill single-track trails with bridges, teeter-totters, a stunt park and more. $28. Rentals available, 403-247-5452. Located 45 minutes southwest of Calgary, the Moose overlooks the Rocky Mountains and offers more than 30 kilometres of trails through dense forest. Experts can hit the super steep trails loaded with switchbacks, jumps and drops. The injury-averse can opt for winding trails, like Brakeless, on the east side. Free. Located on the north bank of the Bow River, between Home Road N.W. and Nose Hill Drive N.W., Bob isn’t for the faint of heart. This rutted and rooted 10-kilometre trail requires good brakes and better balance to avoid falling off the four-metre-high ledge into bloodthirsty thistle bushes below. Free. An 18-minute lift, ascending 1,128 metres, delivers riders stomach-churning dirt and gravel-packed trails littered with fat, life-saving dirt berms embanking the sharp turns, as well as drops and log rides that will satiate even the clinically insane. Well worth the two-plus hour drive to Golden, B.C. $35.95, rentals available. 1.866.SKI.KICK.